Patent, trade mark/passing off, copyright, designs, data-base rights, media, music and publishing licenses and commercial arrangements, due diligence in relation to IPRs in the context of probate, trusts and M & As, confidential information, and all other aspects of intellectual property; information technology and exploitation. Professionally trained and qualified and highly experienced Mediator and Evaluative Neutral, specialising in commercial disputes (with or without IP aspects) in the UK and global disputes. Denise’s practice covers a huge range of areas and subject matters. She has dealt with clients of high profile and is noted for discretion and sensitive handling of clients and team members. Her clerks would be happy to provide more details of her familiarity and experience in your or your client’s particular field, or area of endeavour or interest. Denise has huge advocacy experience acting for parties before the UK Courts and in EU Courts and tribunals, including; the High Court of England and Wales (Court of Appeal and Supreme Court) the Intellectual Property Enterprise Court, or IPEC, the UK Intellectual Property Office, the Company Names Tribunal, the EU Intellectual Property Office, the EU Patent Office and the General Court of the European Union (Luxembourg) and appeals to the Court of Justice. She has also appeared before both the legal and technical Boards of Appeal and the Opposition Division of the EPO. Denise has always been professionally known as Denise McFarland, but her full name is Denise McFarland-Cruickshank. Agatha Christie (dcd. – the Estate of) Armani (Giorgio), Associated Newspapers Limited, AMEX, Arab Horse Society, Astra Zeneca, Airstream Corp.
HRH Princess Diana Memorial Fund, Hasbro, Halewood International, Hikari Miso Co.
Unilever, Universal Pictures & Universal Music, United Biscuits Universities of Cambridge, Oxford, Manchester and many other universities in the UK and abroad. Since non-litigation methods of conflict resolution have become an integral and essential element of civil law practice Denise has a unique experience and diverse skill set which has been the basis of her well recognised and successful track record in alternate dispute resolution and non-litigation conflict management. She is CEDR trained and certified and has a broad range of IP and general commercial / contract/ media experience. 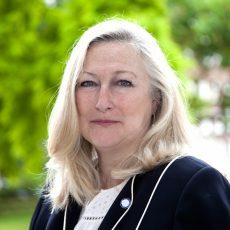 Denise has been appointed by Nominet to deal with their disputes, and she is currently nominated by several large organisations as their first choice mediator for all of their internal and external needs. “Top Job! Thanks a lot”. “We found Denise to be knowledgeable and pragmatic as well as approachable and with great personal attention to the parties’ needs hopes and issues. She had really prepared the papers in depth too. We’d appoint her again and have no hesitation in recommending her to others”. Due to confidentiality issues and the sensitivities of much of this area of her work, case names and parties’ details are withheld but if needed, further details can be obtained from her clerks. Including references if required. Equine and all country pursuits. Bar Theatrical Society. Travelling and hill walking. Various charitable and fund raising interests including in particular the Rorke’s Drift & KwaZuluNatal Educational Project, The Prosthetic Outreach Foundation and the Mayhew Animal Home. “ A strong and persuasive advocate able to digest complex subject matter and formulate comprehensive, pragmatic advice with impressive efficiency”. Known for her client-facing skills and responsiveness, as well as her courtroom skill. She is noted for her work in anti-counterfeiting actions and trade mark infringement claims. She has additional experience advising on patent invalidation actions and mediations, and has recently been instructed in IP litigation with criminal liability aspects. Recent work: Instructed in a community trade mark dispute between Polo Ralph Lauren and the Royal County of Berkshire Polo Club concerning use of the word ‘Polo’. A “natural advocate,” McFarland receives consistent praise for her client-facing skills and responsiveness as well as her courtroom skill. She is noted for her work in anti-counterfeiting actions and trade mark infringement claims. She has additional experience advising on patent invalidation actions and mediations.